[By CT, New for 2014] I've recently come to the conscious realization that caramel is my "go-to flavor." Be it coffee, cookie, candy or ice cream, if there's a caramel option, I'm going for that one. And it seems lately that caramel... more specifically... sea salt caramel, is finding its way into more and more things. And that's fine by me. 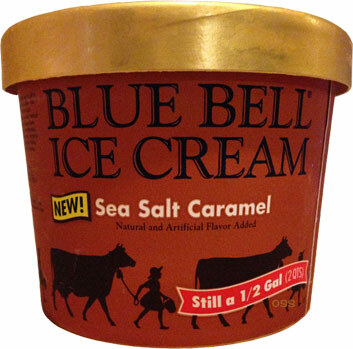 Blue Bell has launched their version of Sea Salt Caramel. Dubba gave me the heads up and I have answered the call more than willingly. Blue Bell's description of this products reads: "A creamy vanilla ice cream surrounded by a tasty salted caramel sauce swirl." 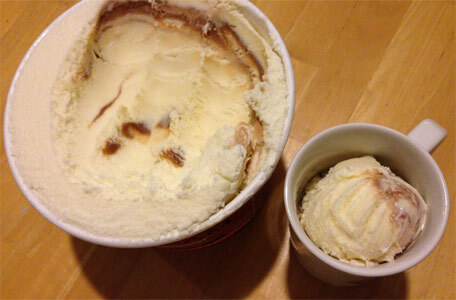 So, for comparison, I've had Haagen Daas Sea Salt Caramel gelato and I've previously reviewed Southern Craft Creamery Sea Salt Caramel ice cream on this blog. The big difference with Blue Bell compared to both of those is that the base ice cream here is vanilla and it is accented by a caramel swirl. For Southern Craft's ice cream and Haagen Daas' gelato, the ice cream/gelato itself has a caramel flavor so every bite delivers that flavor. I can say that I enjoyed Blue Bell's take on sea salt caramel. The swirl itself is delicious and has the right level of sweetness to it. And the salt? Even when I got a swirl-heavy bite, it wasn't really noticeable. There was just enough salt to accentuate the sweet. The consistency of the swirl is very sauce like and not chewy. In fact, the only downside here is that I liked the swirl too much and wished there were more of it. 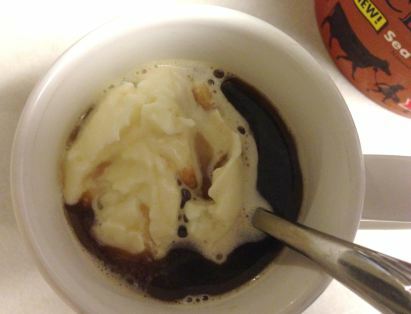 Since it was combined with a vanilla ice cream, it really stands out. If it's absent from a bite, it's really missed. In fact, when I had my first serving of it, I felt there was something lacking. It almost came across too plain. That's not necessarily a bad thing. I think it's an excellent "base ice cream." Grab a few cashews, toss them in and this would be even better. Or, make it a milkshake, which I did, and make sure you spread that flavor around to every bite. That helps. And it's not too overpowering in it's caramel flavor when you do that. And hey, one other idea for this...drop a scoop of this into your morning coffee and let the vanilla and caramel permeate your cuppa Joe. Pretty good! I definitely recommend this, just maybe peruse the toppings aisle before leaving the grocery store. I think you'll wish you had something to go with it if you don't. I've a question about a potential purchase of a tub of Blue Bell Gingerbread House that has surely been sitting in my local Winn Dixie freezer probably since November. Would you buy or no? I'd really like to try it, but am afraid that the whole thing may have some serious freezer burn. What a waste of $7.99 that'd be. Thanks for any advice y'all may be able to give. Love On Second Scoop! flip the container and check the expiration date on it, then compare it to some of the other fresher looking containers on the shelf. the store's track record also matters, I know the store by work often has rampant icing troubles while a store near home often has overly soft ice cream. Not impressed at all. Come on Blue Bell...you taste like Dreyers! Bad attempt at something that sounded so good! The sea salt carmel is so very good,i have tried every brand on the market and I like blue bell best.I wish this was they would keep this in product line permanently. they had this out for a short time and it has gone away. I got addicted to it and now they no longer make it.So please blue bell bring it back,please I will take two cases to start.